The flats and channels off of Islamorada, Florida Keys provide some of the best Tarpon and Bonefish waters in the world. Our Bonefish flats are close by and easily accessible for half- or full-day fishing trips. Tarpon migrate through the main channels and bridges as well as in Florida Bay. 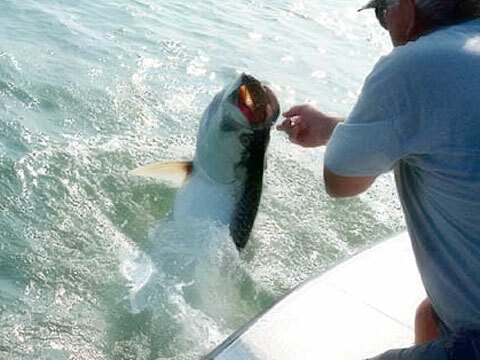 Tarpon fishing can be done on evening trips as well as during the day. An adventure into the Everglades National Park is beautiful as well as exciting. The "backcountry" as it's called, is made up of hundreds of small islands, shallow flats and bays. Fishing can be fantastic on the flats and grass beds for a variety of fish such as Spotted Sea Trout, Redfish, Jack Crevalle, Snapper, Ladyfish and Sharks. In the deep cuts up against the islands, the Snook and Snapper cruise through the mangrove roots awaiting the perfect presentation of your bucktail jig to hit the water. Fishing in the backcountry is for the amateur as well as the experienced angler. For the avid anglers, you can cast bucktails, jigs, plugs and lures. The novice can simply fish with live shrimp and a popping cork. Aside from the fantastic fishing, the backcountry provides a variety of wildlife from birds to alligators. Everglades National Park is home to a large variety of birds including the majestic Bald Eagle, the Osprey, Egrets and Spoonbills. The winter months provide habitat for the largest concentration of White Pelicans in North America. Captain John has fished in the Florida Keys and been located at the Whale Harbor Marina in Islamorada for over 25 years. Tradition follows his family, as he is a second generation captain. Captain John fishes aboard a 17' Maverick "Master Angler" powered by a 2005 115hp Mercury 4-stroke Outboard. He is Coast Guard licensed and Insured. The boat is fully equipped with all necessary safety equipment and electronics. Capt John specializes in Family type Fun fishing trips with action the main ingredient. Father and son, Father and Daughter or Mom and the Kids are the kind of fishing Capt. John enjoys the most. he loves showing youngsters how to fish and enjoy fishing for the rest of their lives.